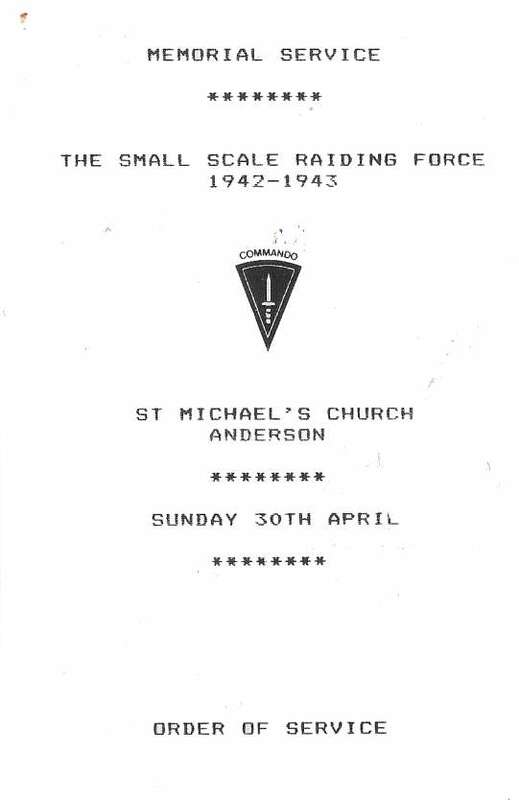 The Small Scale Raiding Force (SSRF) was set up during the early 1940s to undertake "pinprick" raids on the coast of Northern France and the Channel Islands. The raids were designed to gather information and to take prisoners for interrogation while locally having a demoralising effect on the German troops. More generally the unpredictability of the SSRF activities were designed to tie up enemy resources that would otherwise be used on other fronts. Following the evacuation of the Allied Expeditionary Force from Dunkirk in late May early June 1940, there was a need to create a new battleground until Britain and her allies could return to the shores of mainland Europe in great numbers. It would take years to equip and train such a force for a major amphibious landing. Churchill believed that in the interim "pinprick" raids against German coastal defences and installations along the Channel coast of German occupied France would have a demoralising effect on the enemy forces. The raids would also keep the Germans in a state of nervous vigilance requiring the deployment of purely defensive resources. One initiative to meet this requirement was the establishment of the Small Scale Raiding Force (SSRF). 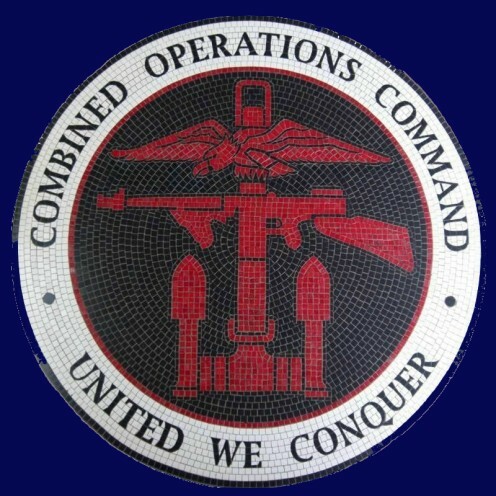 Operationally it came under Mountbatten, the Chief of Combined Operations (CCO), but control was shared with the Special Operations Executive (SOE). [Photo; the famous MTB 344 of Beachy Head. SOE itself regarded this paper as its founding charter and it gradually established agents in Europe and around the world. They undertook sabotage and gathered intelligence in liaison with sympathetic foreign nationals while helping arm and co-ordinate local resistance groups. It was seriously hazardous work requiring a special breed of men and women. 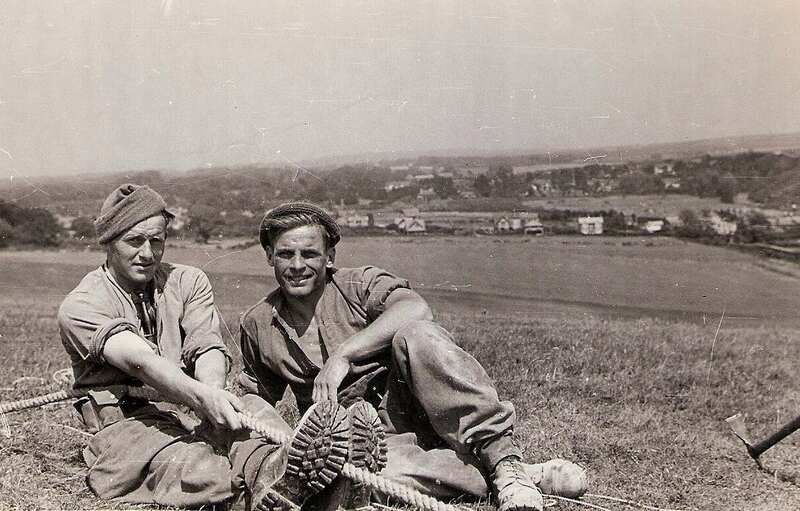 For example ‘F’ section (France) of SOE is estimated to have lost about 25% of the some 480 agents parachuted into France in the latter part of WWII. There were many other raiding forces involving Commandos with naval and air support in many cases. See the Raids and Landings link on our Index page. The SSRF was, therefore, a small part of something much more complex and grand in scale. 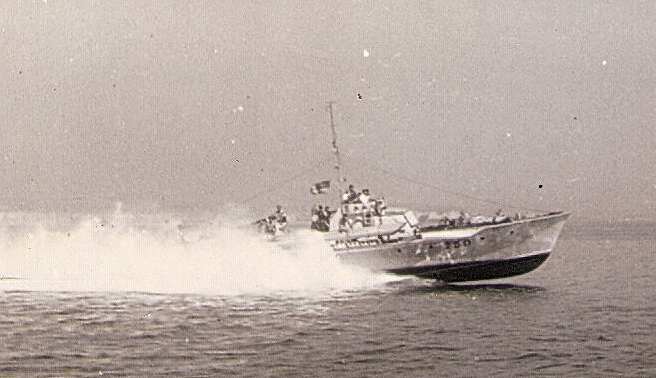 In early 1942 the force was founded by Major Gus March-Phillips, DSO, OBE; Major J Geoffrey Appleyard, DSO, MC, and Captain Graham Hayes, MC.1 They engaged in training the newly formed force at Wareham (Dorset) and later teamed up with Coastal Command's motor torpedo boats (MTBs). MTBs were used because they were very fast and relatively quiet when running on auxiliary engine power only... a combination which minimised detection at sea and when close to shore. Success depended on competence in the use of small boats inshore, particularly the dory - often the boat of preference. A typical raiding party was around 8 to 10 in strength, sometimes fewer. The size of the total force is now uncertain but probably never more than 60 about half of them officers, taken from groups like the Special Boat Service (SBS) and the SOE itself. The nationals of many countries were recruited... French, Poles, Dutch and Czechs. Some with German sounding names were given new identities or 'war names.' Many came from the Pioneer Corps. In 1941, the precursor to the SSRF, the ‘Maid Honour Force,’ was under SOE control. It was named after a Brixham trawler requisitioned by Major Gus March-Phillips. The trawler was converted for the clandestine transportation of weaponry. Maid Honour took 30 men to West Africa in August 1941 in an operation, codenamed ‘Postmaster’. They planned to capture a German tanker in harbour on the island of Fernando Po. The date was January 1942 and although the island was Spanish territory, therefore officially neutral, the mission went ahead and was accomplished taking the German tanker and an Italian freighter! The success of ‘Postmaster’ triggered the expansion of the force and its re-designation as the Small Scale Raiding Force under the Combined Operations Command. 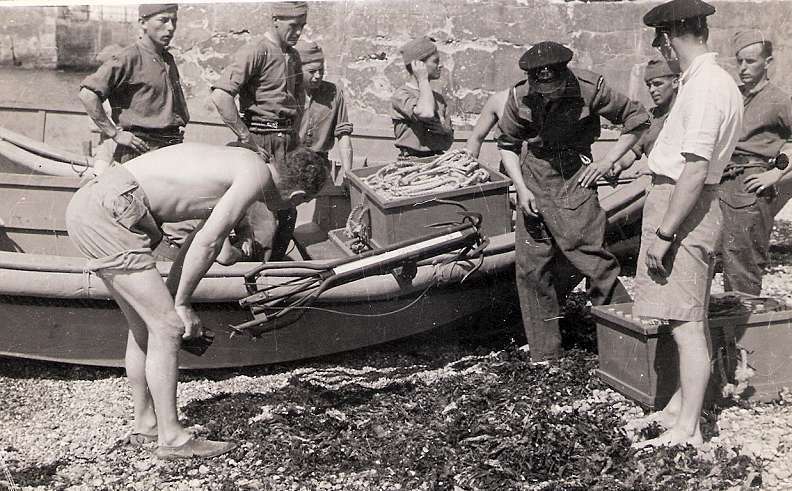 Those selected for SSRF operations were usually trained in Commando style combat together with aspects of seamanship in the use of small craft such as Dory's. 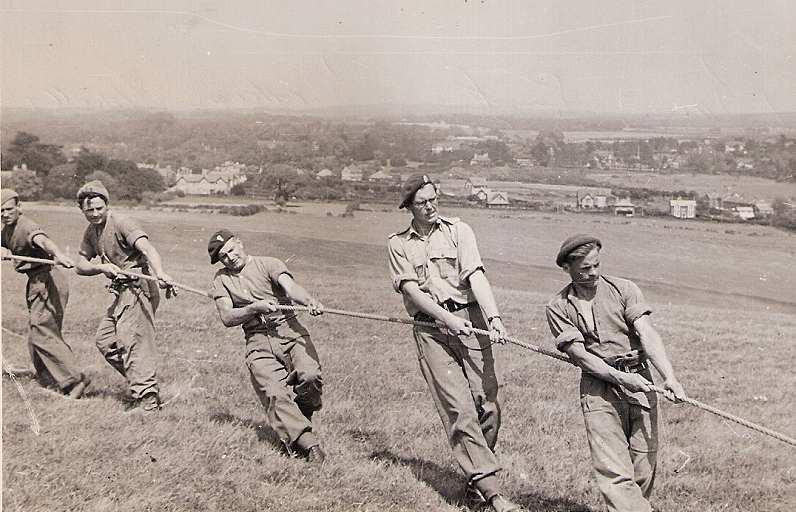 Some training was undertaken in the English Lake District but the photo gallery below shows one group on training exercises on the south coast of England. 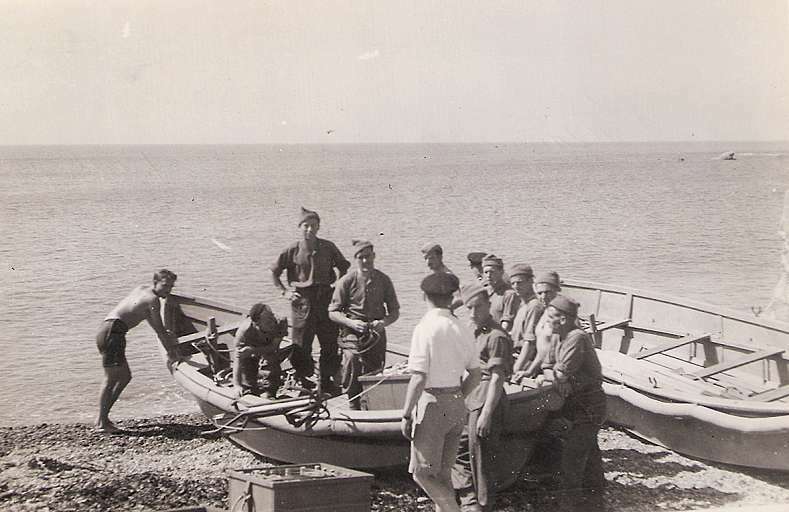 1 Photo of MTB 250 annotated on the back in 1943 by Capt Oswald Basil 'Mickey' Rooney "MTB with Dory aboard". 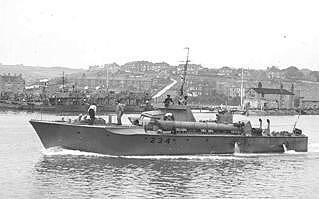 2 MTB 234 Vosper NPs. 3 Putting MTB 250 through her paces; here travelling at about 30 knots. 6 Practicing Dory landings was an important part of the training. It was the means of travel from the MTBs to the shore and had to be undertaken safely and quietly in all conditions to minimise the risk of detection. 7 A motor powered Dory with another in tow. Practicing this manoeuvre envisaged the need for rescue or where two Dory's were required. 8 Preparing to launch a Dory from an MTB. 9 Training with grapnels and Dory. 10 A grapnel stored inside a Dory. The grapnel was a multiple hook attached to a rope. It was thrown, or fired by rocket, up a cliff or other obstacle. 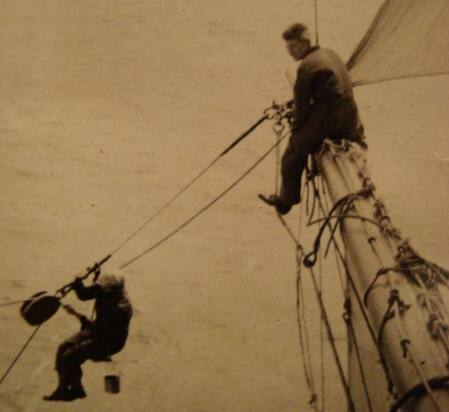 When a firm mooring was achieved the SSRF would ascend the dangling rope and onwards to their objective. 11 Practicing grapnel shoot up a cliff. 12 O.B. Rooney & J Barry training at Beachy Head. 13 Barry, Smith, Broadshaw and Howells. 14 Relaxing for the camera on completion of a rope climb up a cliff. 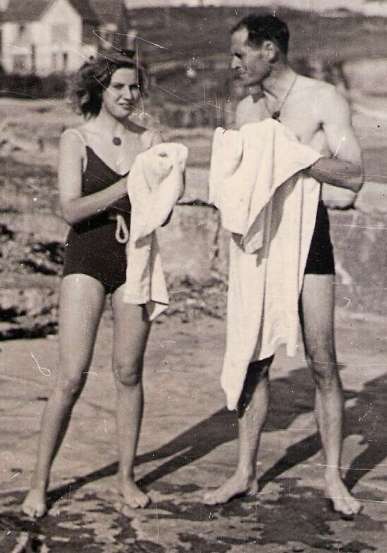 17 Ted Fynn & wife. 18 Training in boat handling. 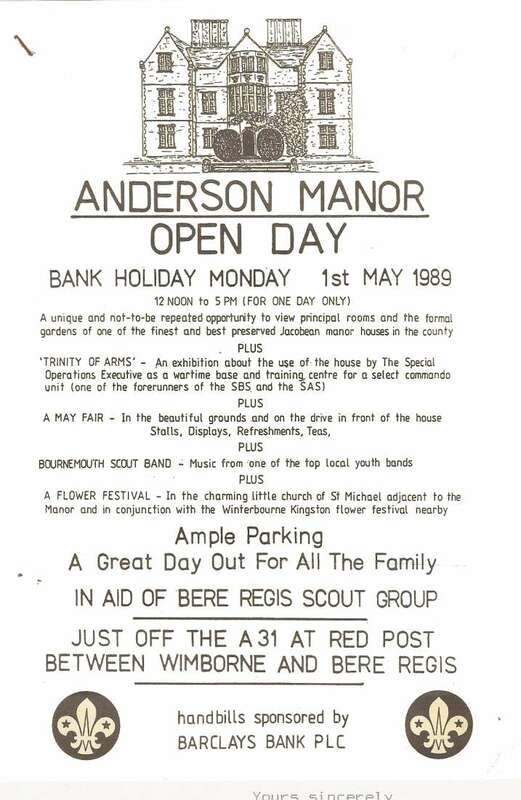 Anderson Manor in Dorset was taken over by the War Dept. during the Second World War as the headquarters for the Small Scale Raiding Force (SSRF) of 62 Commando. After the SSRF disbanded in 1943 its wartime role as Station 62 under the Special Operations Executive (S.O.E.) came to an end. 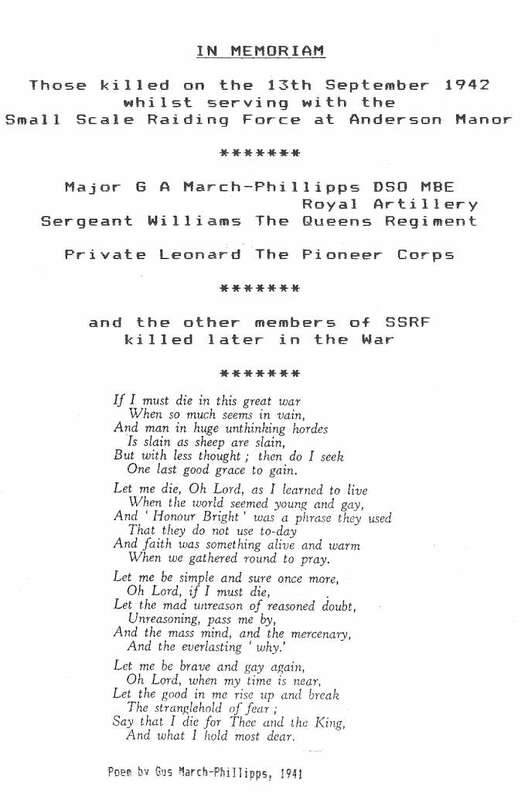 Forty-six years later in 1989 a service of remembrance was held in the St Michael's Chapel, Anderson attended by surviving members of the SSRF and family representatives of those who were killed in action or who had subsequently died. 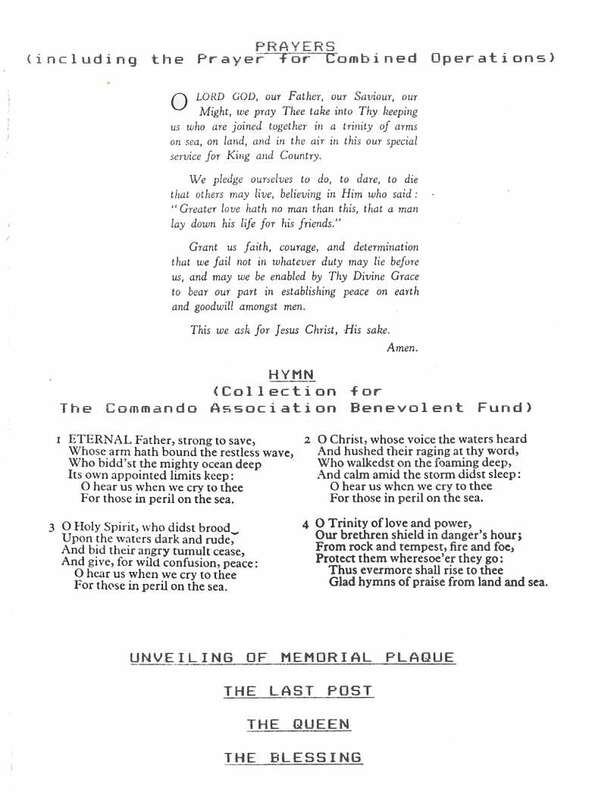 Included in the images above are details of the ceremony and the Prayer to Combined Operations. No 12 Commando had contributed to a number of SSRF raiding parties. For Operation Fahrenheit it was the turn of Captain O B 'Micky' Rooney and 6 of his NCOs. 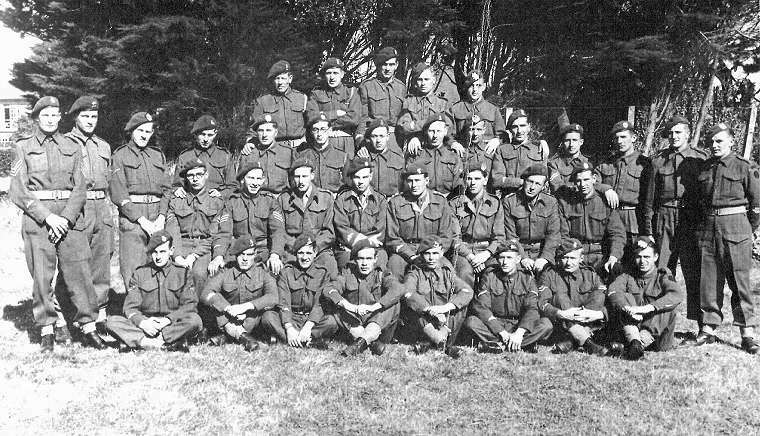 The photo shows Captain Rooney (seated 2nd row from the front and 4th from the right) with No 4 Troop at Littlehampton, Sussex. Peter Kemp, Brian Reynolds and Sergeant Nicholson trained them for the raid. Kemp found Rooney to be "a powerfully built, self confident officer" and that apart from pistol shooting and movement at night "he and his men knew more about the business than I. The objective of the raid was to capture German servicemen for interrogation by attacking a signals station at Pointe de Plouezec on the north Brittany coast. On the night of the 11/12 November 1942 they departed Dartmouth in MTB 344 under the command of Kemp and correctly identified their target. On reaching the cliff tops they found the area heavily mined. Rooney and one of his men checked out the station and a nearby pillbox. The former was protected by wire and sentries and the latter was unoccupied. The cable from the pillbox was cut. Only a frontal assault was possible so, split into 3, they made their way to within 10 paces of the wire. The sentries could be heard in conversation. Rooney unscrewed the top of his No 6 grenade which was heard by the sentries. One gave out a sharp exclamation and drew back the bolt of his rifle. A blinding flash and tremendous explosion followed immediately. Both sentries were finished off with Tommy gun fire and Rooney's party moved forward past an empty guard house to await the emergence of the station's occupants. The first two were shot but when the others returned fire it was decided to withdraw before reinforcements arrived. In a larger fire fight it would be difficult to evacuate any casualties back down the cliff to the beach. The party successfully re-embarked and returned to Dartmouth. Chris Rooney, Captain Rooney's son states "I understand this group, called "Rooney Force" for the task ahead, were to raid the U boat pens at Brest but it was called off. I can't put a name to the raid and there seems to be no official record. 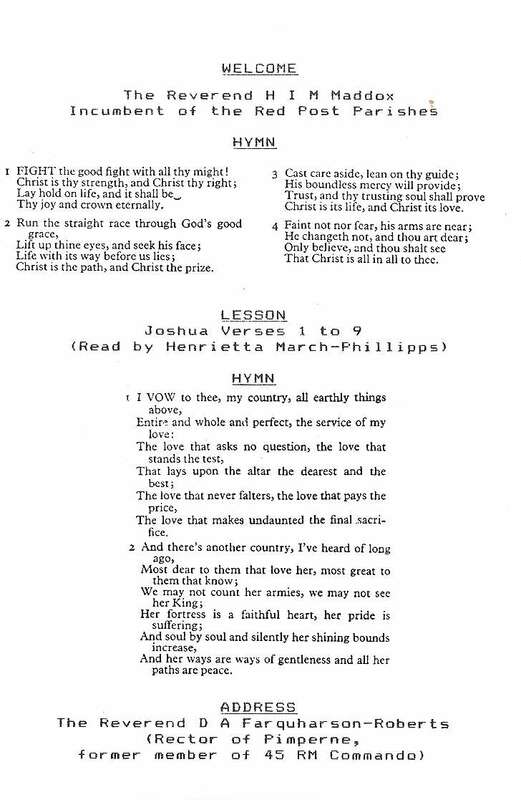 I also understand that if a group were trained for a job of this type they were permitted to design their own badge. The example opposite was sent to my father in the 1980s by Peter Cruden (third from the left, 2nd row, seated in the photo). There may also have been a badge for Fynn Force." The status of these badges is unknown. If anyone can shed any light on the subject please let us know using the Contact Us link in the page banner above. Freddie Bourne (Courtesy Clay Maxwell of the LST Club's "Bow Doors" Magazine). 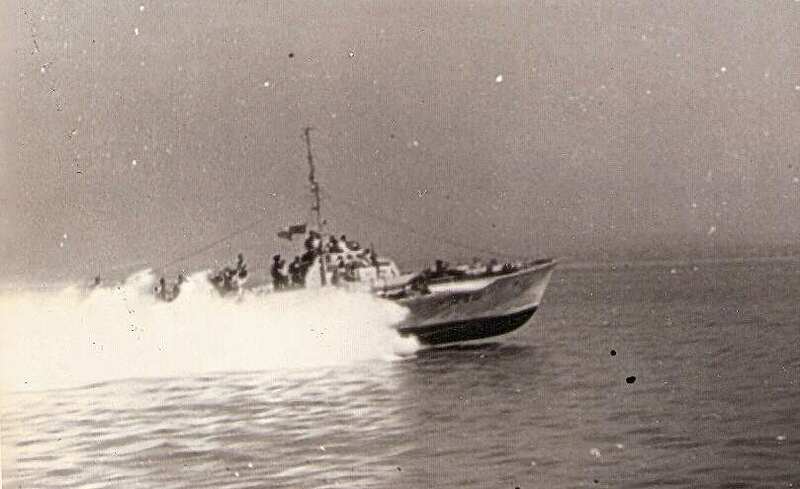 Freddie Bourne served in Motor Torpedo Boats (MTBs) with Britain's Coastal Command Forces during WW2 attacking German convoys and warships and ferrying commandos to occupied France and the Channel Islands. It is the latter role that is of special interest to Combined Operations. Bourne was based at HMS Gosport when he became involved in Coastal Forces. A chance meeting with Lt Roger Thornycroft, of the well known shipbuilding family, resulted in his association with their small high speed vessels. Experimental types were built in 1942 and numbered 344, 345 and 346. No. 344 was 60 ft long and the other two 45 ft long. 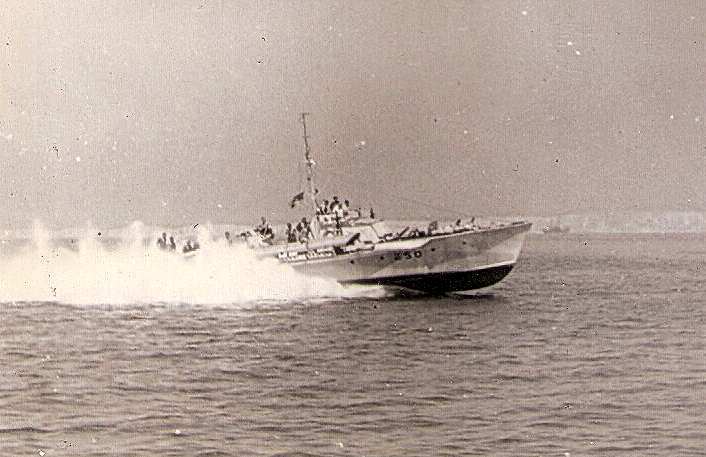 All were twin-screwed and powered by Thornycroft petrol engines of 1200 BHP giving a speed of up to 40 knots. For action against shipping they were armed with two 18" torpedoes. 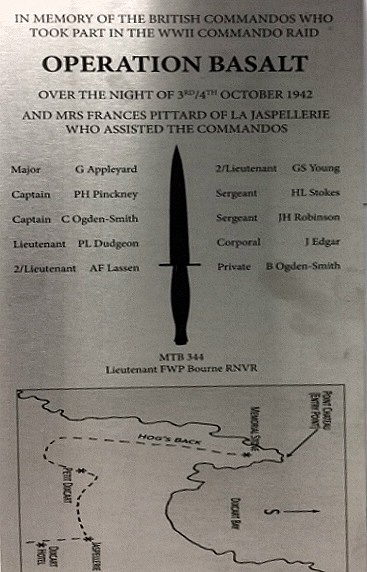 At this time Bourne was a lieutenant waiting for his first command which came in the form of MTB 344. The Navy made her available to the SSRF and this began Bourne's involvement with the organisation. They christened her "The Little Pisser" because of her high power compared with the motor launches the Navy had offered earlier. For the clandestine missions the MTBs engaged in they normally sailed at dusk. When they were close to their objective the main engines were cut and the approach made on the auxiliary engine. Because of her relatively small size MTB 344 was difficult to detect by radar. Her armaments comprised two Vickers machine guns either side of the bridge and Lewis guns aft of the crew's quarters. Apart from Bourne she had a crew of seven. On the night of September 2/3 1942 MTB 344 was anchored off the Casquets lighthouse, seven miles west of Alderney, which was being used by the Germans as a radio listening post. Bourne lowered an 18 ft dory from the boat which then carried 8 raiders to the rocks beneath the lighthouse. When they returned later they had the enemy's code books and seven prisoners - the lighthouse keepers, radio operators and guards. 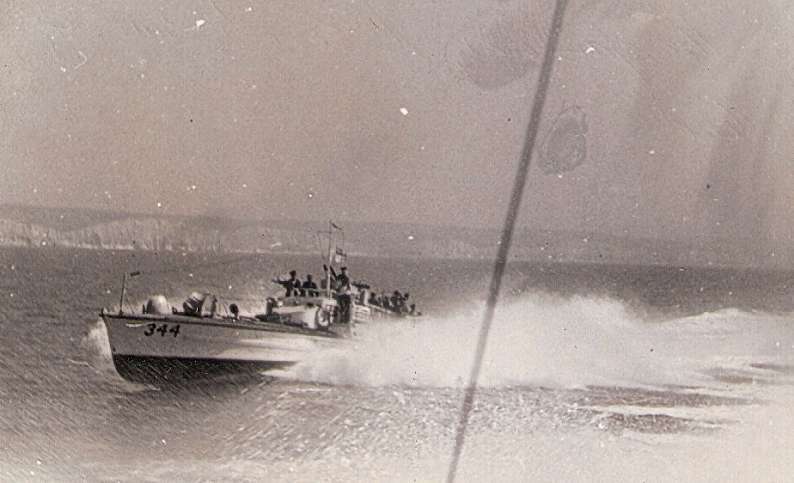 Later that month MTB 344 took part in Operation Aquatint when raiders landed on a beach in the Baie de la Seine near Cherbourg. 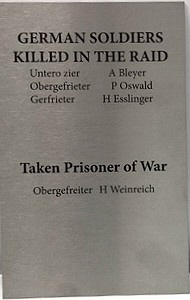 On this occasion the raiding party was ambushed by a German patrol and all the Commandos were killed. 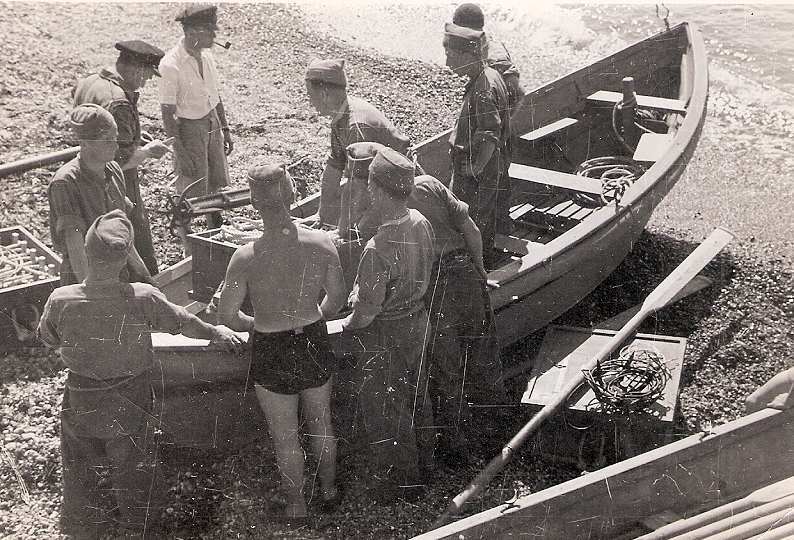 Some were shot in the water as they attempted to swim back to the boat and one of the MTB's engines was put out of action by a German bullet. Bourne had to flee on half power. His next operation was to occupied Sark in the Channel Islands. This raid was to have very serious, unforeseen consequences for all future 'special forces' operations in enemy held territory. The raiding party landed successfully, evaded a German patrol and broke into a house belonging to a Mrs Pittard. She provided invaluable intelligence including the whereabouts of the enemy garrison - an annex of the Dixcart Hotel. The Commandos killed the guard posted outside the building and stormed in. The five soldiers billeted there were taken prisoner but, as they were being escorted to the beach, they began to struggle and scream for help. Unable to quickly pacify them, and fearful of being discovered, the prisoners were shot regrettably still with their hands tied. As a result Hitler ordered that any British Commandos captured armed or unarmed, in or out of uniform, should be executed with no exceptions. (See Glomfjord for information on the first use of Hitler's Commando Order). However, a very different account was told to an American Newspaper in 1945 by Major O B Rooney. He said "We were raiding the Channel Islands. Our mission was to get prisoners for information. This time we couldn't find any prisoners . We decided to ask a friendly lady we knew where the nearest German garrison was. She told us. We found them in bed. There were six of us and eight of them so we tied their hands with string and marched them out. One of them, becoming sufficiently awake to guess they were in the hands of the enemy, tried to escape. One of our men hit him with his revolver and it went off. He was killed." In all Bourne and his crew in MTB 344 took part in 17 raids off the north coast of France and the Channel Islands. He left 344 in May 1943 on appointment to Flotilla 11 at Felixstowe. In January 1943 the SSRF raids were coordinated by an Auxiliary Operations Group and independent raids in the English Channel ceased. 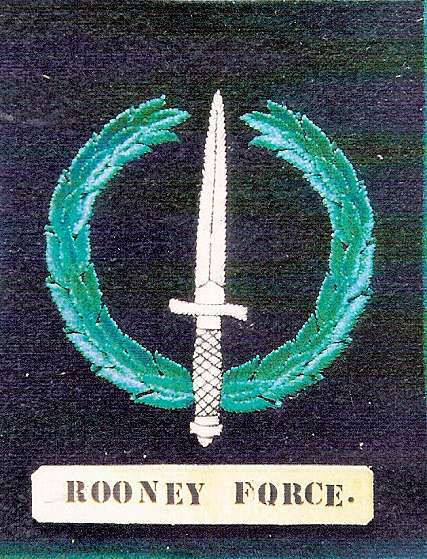 SSRF was later disbanded and for his part in their operations Bourne was awarded the DSC. 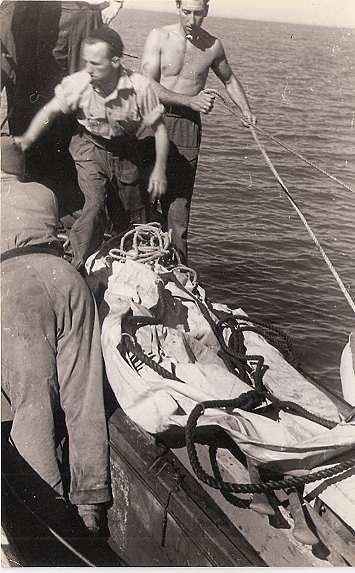 On the night of 12/13 September 1942, a Goatly, which was a canvas sided wooden bottomed collapsible boat, 17ft 6ins (5+m) long with a beam of 4ft 6ins, weighing 2 cwt that could be assembled by two men in 1.5 minutes, dropped Graham Hayes with 9 men at St Honorine des Pertes near the Cherbourg Peninsula. Geoff Appleyard remained in the MTB having sustained a leg injury on an earlier raid. He heard the landing party ambush a German patrol only to hear them ambushed by a larger German force. Gus March-Phillips and three of his men were killed as they returned to their boat on the beach. The flimsy canvas sided boat sank leaving Hayes to swim along the shore. Malcolm Hayes continues "One bit of information about Capt Graham Hayes is that before the War he went to Mariehamn in Finland and signed onto the Windjamer 'Pommern'. 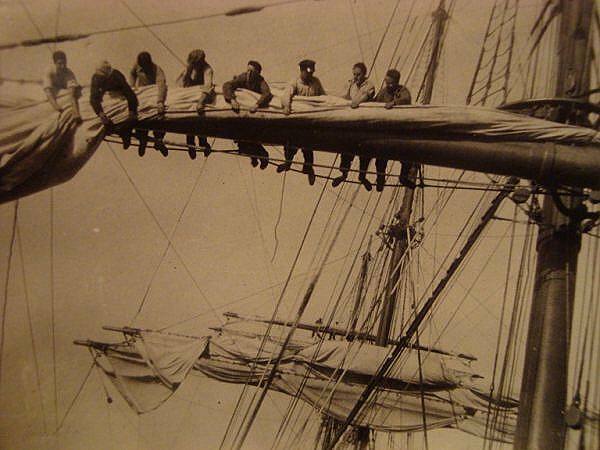 On this, he sailed round the world via Cape Horn and Australia. 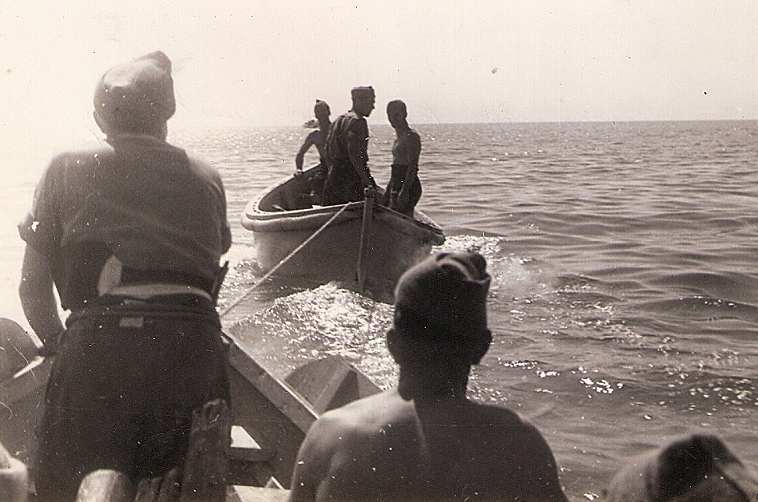 This experience of the sea stood him in good stead for sailing the Brixham Trawler 'Maid Honore' to the island of Fernando Po, in the gulf of Guinea, West Africa. Codenamed Operation 'Postmaster', for which he was awarded the MC. I attach photos taken by Graham on the Windjamer 'Pommern'. The Pommern still exists and is a Museum Ship in Finland." Other Actions (not a complete list). Anse de St Martin, Cherbourg Peninsula - 2 men in a canoe to reconnoitre the area. Omonville - 10 man raid to capture German prisoners for interrogation. Herm & Jethou, Channel Islands - 10 man raid. Pointe de Saire - 3 enemy killed. Operation Basalt - Sark. (See Correspondence below). Operation Hardtack 7 - Sark. (See Correspondence below). The first event was the unveiling of a Commemorative Stone on the Hog’s Back, with the unveiling taking place at 3 pm on the afternoon of Tuesday the 3rd October, in the presence of over 70 persons from Sark and further afield. The stone carries two plaques, the main plaque commemorates the Commandos and Mrs Frances Pittard, who assisted them, the other plaque gives the names of the three German soldiers killed in the raid and the soldier captured and taken back to England as a Prisoner of War. The unveiling ceremony commenced with a welcome address by the Seigneur of Sark, Major Christopher Beaumont, (also the President of the Sark Branch of the Royal British legion). The unveiling party, who removed a Union Flag draped around the stone, were Mr John Appleyard (half-brother to Major Geoffrey Appleyard who planned and led the raid and who did not survive the war) and Lieutenant Colonel Reg Guille MBE, Chairman of the Sark Branch and late Army Commando. When the stone had been unveiled John Appleyard, made a moving and emotive speech in reply to the address of the Seigneur. After the speech people were invited to move forward and view the commemorative stone and its plaques, with many photographs being taken. Various radio and TV interviews were then carried out and people slowly drifted away back to their hotels or homes. The ceremony was blessed with perfect weather conditions, with Jersey in the distance giving a perfect back-drop to the commemorative stone. The second event was a Presentation on the raid by Mr Eric Lee, author of the book “Operation Basalt - British Raid on Sark and Hitler’s Commando Order”, at 7pm at Stocks Hotel. The evening commenced with a welcome address from Reg Guille, who also introduced the speaker. After the very interesting talk by Eric, a panel was then formed to take and answer questions – the panel members were Eric Lee, John Appleyard and Mr Chris Oliver (Local Historian from Guernsey), the panel were introduced by Reg Guille. There followed thirty minutes of questions and answers on the raid and the personalities who took part in that raid. The panel were roundly applauded for their efforts. This was followed by a sumptuous buffet laid on by the hotel, the centre piece being a very large cake made by Mrs Helen Plummer in the shape of the Hog’s Back, Dixcart Bay, Dixcart Valley, Jaspellerie Headland and which also depicted Dixcart Hotel, Jaspellerie House and Petit Dixcart House. The 60 plus audience then left, much later, to walk home under Sark’s Dark Skies. The third and final event, also blessed by fine weather, took place on Wednesday the 4th October with a battlefield walk ‘In the Footsteps of the Commandos’. The walk was led by Major Marco Ciotti (late RLC) (ADC to His Excellency The Lieutenant Governor of Guernsey), ably assisted by Ms Jan Guy and Mrs Jenny Hopkins. The 50 plus walkers gathered at the Visitor Centre before walking to the Hog’s Back, where Marco introduced the personalities and background to the raid before leading the walk along the route taken by the Commandos - along the spine of the Hog’s Back, past Le Petit Dixcart House where they stopped for a briefing, then to La Jaspellerie House for a further stop and longer briefing, before moving on to view the ‘Casino Oak’ (planted a few years ago in memory of Major Geoffrey Appleyard with an acorn brought back from Casino by Marco Ciotti, where Geoffrey is remembered on the memorial to the men with no know grave in the Commonwealth War Grave Cemetery at Casino). The walk then went on to Dixcart Hotel (closed) where the German soldiers were captured and the crux of the events of that evening 75 years ago took place and which led to the deaths of the three German soldiers and the taking of a prisoner, before the Commandos beat a hasty retreat to their MTB (nicknamed The Little Pisser) and made a successful return to Portland, as daylight broke on the morning of the 4th October 1942. The walk lasted some three hours and most then repaired to Stocks Hotel, just a few yards away, for refreshments. Sark was pleased to welcome many members of the Appleyard family, including Nieces and Nephews and their spouses who live in Guernsey (the Woods family who ran Herm for many years) and members of the Bramley War Memorial Trust, Bramley being where the Appleyard family lived. Unfortunately, descendants of other Commandos who took part in the raid were unable to attend due to commitments elsewhere. 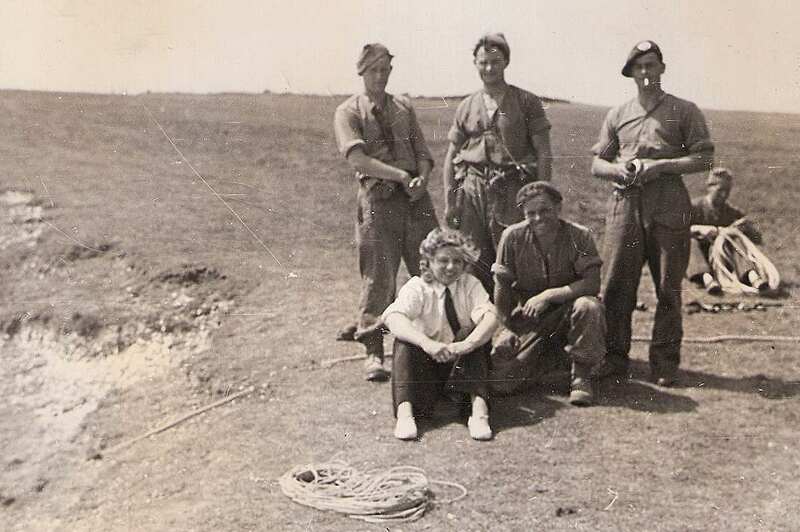 Sark was to be raided once more on the 27th/28th December 1943, during Operation Hardtack 7, which was a disaster for the Commandos with two of the party killed by mines. 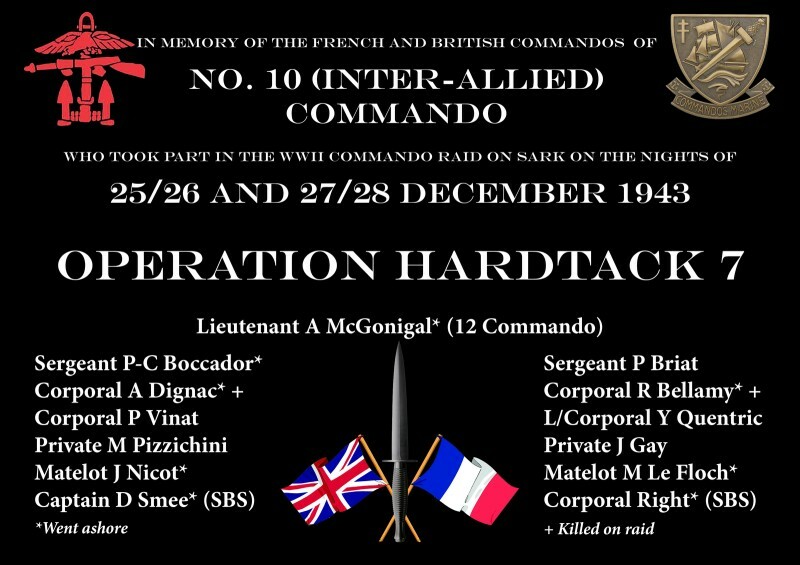 However, the Sark Branch are already planning a commemorative event to mark the raid on its 75th Anniversary, the 27th/28th December 2018. Small Scale Raiding Force. 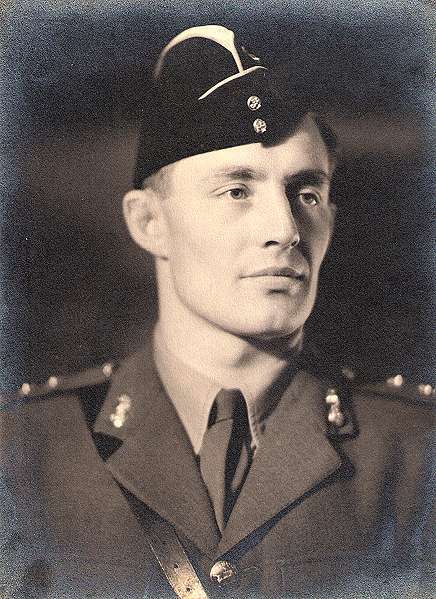 I have been commissioned to write the full history of Gus March-Phillipps’ Small Scale Raiding force from its origins as Maid Honor force in 1940, though Operation Postmaster to its evolution into 2 SAS in early 1943. I am most anxious to trace the next of kin of Major Gus March-Phillipps DSO, MBE and Major Geoffrey Appleyard DSO, MC and bar, MA and to make contact with any surviving members of that original raiding force, cover-name No 62 Commando. After reading the book ¨If I must Die¨, the fate of my Uncle, Graham Hayes, as described on your website may not be correct in stating that he was handed to the Germans by the the Guardia Civil in Spain after arriving there. According to this very well researched book, written by two Frenchmen, Graham was intercepted in Paris by a French double agent called Ortet. He accompanied Graham on his journey to Spain. If they did reach Spain it was only to try to cover this agent's tracks by putting the blame on the Spanish, before he handed Graham to the Germans. The proof that Graham was double crossed is contained in letters he wrote for Ortet to give to the French Resistance which he handed over to the Abwehr. Andre Heintz and Gerard Fournier, the authors of the book, must have the documents that tell the full story. The double Agent was known as "Armand", but his full name was Jean-Louis Ortet. He was found dead in a pond on the 1st September 1943, by whose hand is not known. Another curious twist to the story. I recommend this book to anyone interested in the subject. I was directed to your excellent website by Bert Markham who served in the SSRF. He was a crew member on MTB 344 and later of MTB 494. During the night of the 6th of April 1945 he was onboard 494 during an engagement with German S-Boats. 494 was rammed and sunk by S-176. 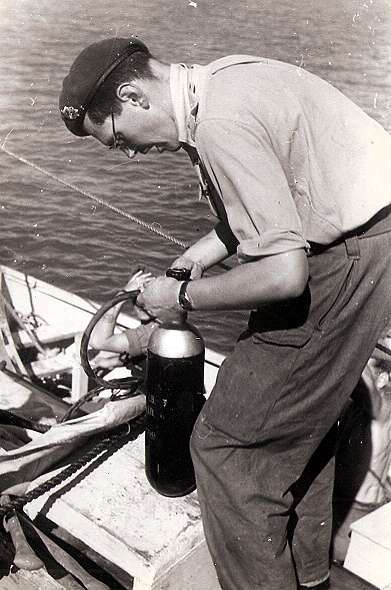 My cousin, Gus Holland, was also a member of the crew of 494 on that night and sadly perished after the engagement. According to all the accounts of this engagement, including a report by the German Skipper of S-176, there were only two survivors from 494. However, it now transpires that Bert Markham was a third survivor! Bert and my cousin Gus survived the collision with S-176 and sat on the upturned keel of 494 along with the boat's radar rating. Nearby was 493 which was immobilized and with its forward section completely destroyed. The crew continued to fire their Lewis gun at the other attacking S-Boats. 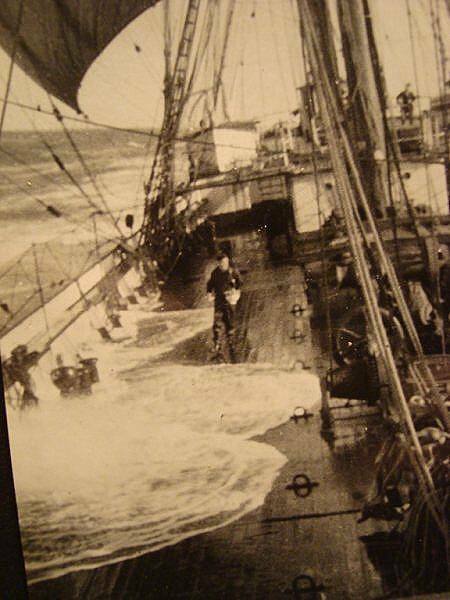 The crew of 493 saw Bert, my cousin Gus and the radar rating clinging to the keel of 494. Since 493 was immobilised, Bert swam to its stern and was pulled onboard while Gus swam to the badly damaged forward section. Bert saw Gus clinging to the shattered remains of the forecastle and urged him to swim to the stern but before he could do so he lost his grip and floated away. The radar rating never made it to 493. 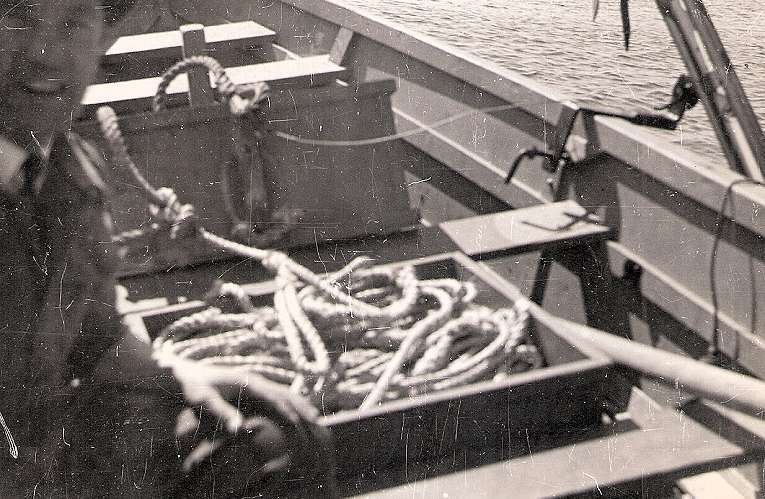 The next day Bert saw the bodies of Gus, the radar rating and the boat's Mid Shipman being brought ashore. Unless otherwise stated all photos and images courtesy of Capt O. B. "Mickey" Rooney's family. 1. All three were killed in action while serving with SSRF or other special forces units.